Originally from Jersey City, New Jersey, Enzo Cristantiello is both a clown & comedian. Being a teen in the 80's he developed an appreciation of silly music, silly hair & silly jokes. With a degree in accounting and a very short stint in that field, he thought "This is bogus, Dude"! While wearing a suit and sitting behind a desk, he realized there was more he wanted than 9 to 5. An opportunity to join a team called "The Lizard Guys" was exactly what he needed in order to do what he was born to do.....to entertain (& clean animal cages)! 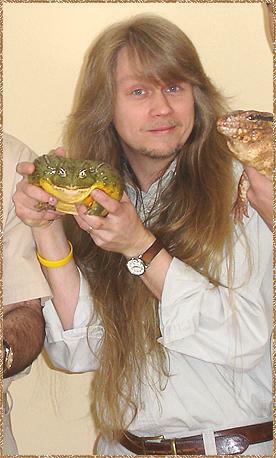 Now, why would you want Enzo to educate your children about reptiles & amphibians? Because he's good at it (& having two kids of his own gives him that first-hand insight that kicks it up a notch)! Graduating fourth in his class, teaching is the easy part but it's his ability to entertain & capture the interest of his audience that sets his presentations apart from the other organizations. Like the rest of The Lizard Guys, Enzo's presentations are TOTALLY unscripted. Because he's a natural entertainer with a secure handle on the knowledge of the animals, his improvisation takes on a reptilian flavor that only The Lizard Guys can serve. 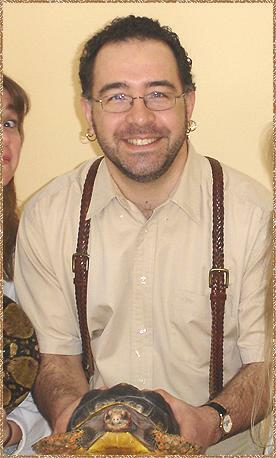 ...If you still question his sense of humor, just look at those suspenders! Who is this guy and WHAT IS UP WITH THAT HAIR?? Graduating with the business/accounting award & on the verge of entering the same field as his high school buddy Enzo (yes, the one with the suspenders! ), he had a last minute "career " change.......a glorious position in retail management. Being as stubborn as his hair is long, he decided to follow his heart instead of his head by surrounding himself with people. In the early 90's he happened upon "Seymor", an unwanted Red-eared slider turtle that Billy almost ran over & who changed his life (which Billy still has). After 8 years in retail he jumped at the chance to meet new people & to boldly go where no one has gone before.... The Lizard Guys. As a full time presenter for The Lizard Guys, a husband to Jenny & a father of twins he's living his dream. Whether Billy is entertaining your child's birthday party, scout meeting, library or summer camp, his philosophy is the same: make it as fun for the audience as it is for him, period. As the wife of "Silly Billy", the mother of twins and 13 years experience in child care, you can say that Jenny Harkowsky has the kind of skills needed to be one of The Lizard Guys. Jenny & Silly Billy met in 1991 & instantly connected. Along with many common interests they developed a love & amazement for reptiles & amphibians. While living in a confined apartment, they realized they needed an escape from the hustle and bustle of the city. Jenny & Billy and their two children now find themselves very much at home surrounded by acres of woods and wildlife. It's a common misconception that "this is great for my son, but it's going to frighten my daughter" and Jenny is proof that lizards, snakes, turtles, frogs & bugs aren't only for the boys. As one of The Lizard Guys she has the knowledge of the animals, and her experience as a teacher & parent gives her the tools needed to get that knowledge to the children. 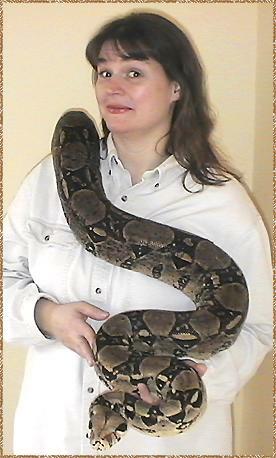 The interest in animals is alive in children and adults alike, and Jenny's presentations are just as alive. We live in a time of environmental conservation and awareness & Jenny and The Lizard Guys help spread that awareness in a fun, interactive & educational presentation.